Hastings United Football Club contested its third consecutive 1-1 draw in a game which ended 10-a-side this afternoon (Saturday). Chris Agutter’s side shared the spoils away to Whitstable Town in the Bostik League South East Division despite leading at half time through Jordy Mongoy’s eighth goal in seven matches. Hastings remain third in the table, but the four teams immediately beneath them all won and they are now just two points ahead of fourth-placed Horsham having played a game more. 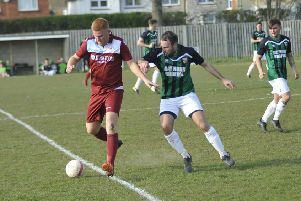 Injuries and suspensions meant that Hastings’ resources were extremely stretched for the trip to north Kent. Indeed, captain Sam Adams played the full 90 minutes despite being unable to move his neck in the morning - the club physio worked on the problem on the coach trip to Whitstable - and Sam Cruttwell played with a badly bruised foot. The match went ahead after the Belmont Ground pitch passed a 9am inspection, but the surface was very soft and tore up very easily. Hastings seemed very much in control for much of the first half. The visitors enjoyed the lion’s share of possession, albeit without really getting in behind the Whitstable defence as the hosts often dropped a lot of players behind the ball. They eventually did break through in the 41st minute. Mongoy found himself in some space on the right and advanced into the corner of the penalty area before beating home goalkeeper Dan Eason with a beautiful chip. Hastings almost had another before the break. Adams was whiskers away from getting on the end of a lovely cross from Mongoy as he slid in at the far post. Whitstable pinned Hastings back somewhat during the second period, however, as the visitors took quite a while to get into their stride after the restart. The home side duly equalised on the hour, although Hastings certainly weren’t happy with the referee’s decision to award the goal and goalkeeper Charlie Horlock was booked for protesting. Jordan Wright’s free kick from the left ended up in the far corner of the net having seemingly missed everyone in the box. A Whitstable player jumped to try to head the ball as it was delivered into the area and the linesman raised his flag for offside, but the referee awarded the goal. Hastings players surrounded the referee, who then consulted with his assistant, but allowed the goal to stand as he decided the player hadn’t touched the ball. The game then became quite end to end, albeit without either team really carving out a clearcut chance. That said, Mongoy was denied by Eason from close range after Tom Walmsley fired wide for Whitstable when unmarked at the far post. Things got a bit niggly in the last 10 minutes or so and both sides had a man sent-off late on. Whitstable substitute Ricky Freeman made a poor tackle on Adams and a melee ensued between the two sets of players. After things eventually settled down, Freeman was shown a red card for the tackle and so was Hastings defender Temi Eweka for his part in the skirmish. That was Hastings’ third dismissal in just eight days. Both teams tried for a winner in the short time that remained, but neither really threatened and there was another melee near the home dugout after the final whistle. Hastings: Horlock, Eweka, Climpson, Howlett-Mundle, Cruttwell, Lovatt, Ajakaiye, Adams, Mongoy, Bamba (Curran 85), Fielding. Subs not used: Hull, Pool, Makwiramiti, Moynes. Attendance: 222.